Building upon their architecture meets industrial chic aesthetic, Ruifier, the London-based label is bringing playful wearability to the forefront with their fine jewelry this season. Versatile, colorful and fun, you'll see a clever story unfold in each of their collections. From a smiling face to hearts, crosses, stars and eyes, their Visage collection is colorful, clean and lends itself to clever stacking while giving off a wondrous charm. Done in a palette of semi and precious stones and 18 karat yellow, rose-gold and black-gold, the rings are paired with rubies, pink and orange sapphires, tourmalines, amethysts, blue topaz and diamonds making each piece fit seamlessly into everyday life in the most joyous way. Based on the notion of interlocking, their Celestial collection is made up rings that can be worn as two pieces together, reversed or separately. 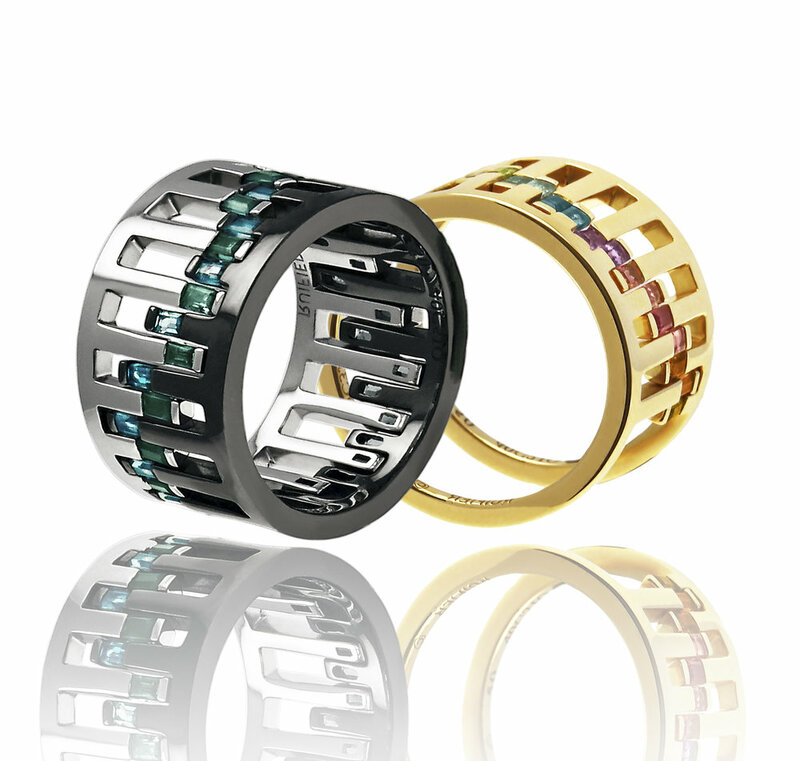 Their Equinox ring is made with 18 karat white-gold and incrusted with 18 blue tourmalines, a white like the day ring touches with the night 18 karat black-gold ring to represent the bi-annual balance of the the northern and southern hemispheres. The Solstice ring follows suit in 18 karat white-gold. Focusing on cutting precious stones into triangular shapes, there's the Stella collection which creates an illusion of a magnified helicon and lives in rings and necklaces while their Galaxy collection is set on 18 karat rose-gold and detailed with pink and yellow sapphires to represent the dynamic state of the universe. Learn more about this label at Ruifier.